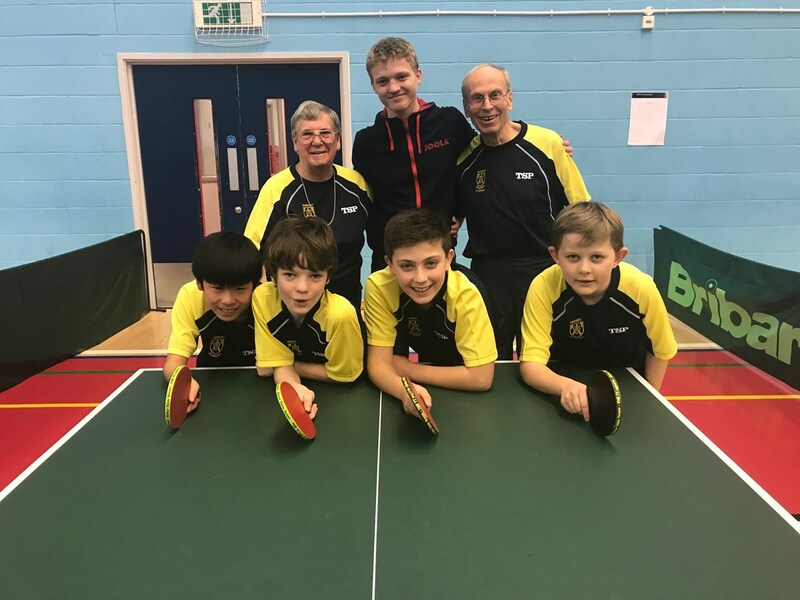 The Amherst School Boys Under 11 table tennis team reached the finals of the Butterfly National School Team Championships on Saturday on Day 1 of the Southern Region finals at Bristol Academy of Sport. They had qualified for the event by winning the Kent Schools Under 11 Boys’ title and coming in as runner up at the Zone 7 finals. Two teams of four players from each of Zones 5 – 8 covering the whole of the Southern Region from Kent to Cornwall compete over two days, two Zone runners up and two winners on each day. Each match consists of eight sets, each player competing in two sets. Amherst Yiannis Papadopoulos, Sam Arnott, Felipe Fujimori and Daniel Henderson were in a group with Millfield Prep (Somerset), the winners of Zone 8, the runners up from Zone 5 Chalfont St Peter’s CE Primary and the winners of Zone 6 Coldfall Primary, Muswell Hill, all play all. In Round 1 Amherst beat Millfield Prep 8-0 which wasn’t as easy as it appears on paper and Chalfont St Peters 6-2 in Round 2. Sam and Felipe were unbeaten with Yiannis and Daniel picking up one win each. Their toughest opponents were expected to be Coldfall. It was in effect the final. Amherst had four points in the bag from their two wins but Coldfall had lost to Millfield so Amherst needed only one point to get to the National Finals. The first set was lost. However, Yiannis got the team back on terms and, despite many close games, Amherst surged forward to a 7-1 win. Felipe was unbeaten on the day, a most creditable effort. Amherst hadn’t expected to qualify but turned in an absolutely magnificent performance. Losing just three sets during the entire day is a quite remarkable achievement. The boys have been coached by David and Janet Field since Year 4. Two former Amherst pupils, Thomas Arnott and Ben Jakes, have given up a lot of time to assisting at the after school club and without doubt have been an inspiration to the team. Thomas was there to support them. As multi Southern Region finalist and National Team finalist with Tunbridge Wells GSB himself he was able to call upon personal experience to help guide the boys through a tough day. Two teams qualified from the Northern Region and two from the Southern. The second team to qualify from the Southern finals were Earls Hall Primary, Essex, who beat Amherst in the Zone 7 final. The National Finals are to be held in Hinckley, Leicestershire on 23rd March.